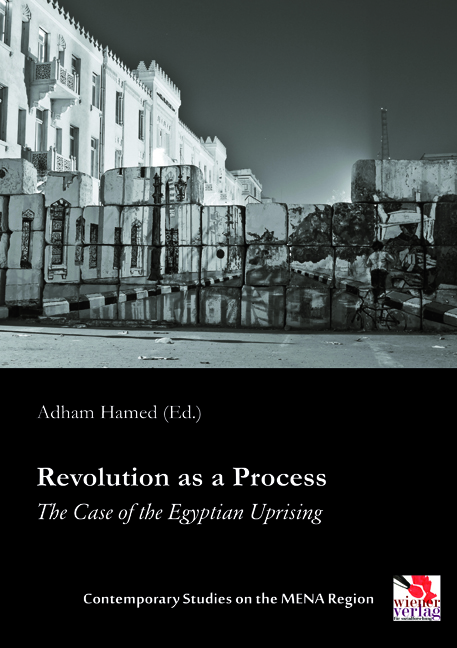 As Egyptian society stands at a point of extreme polarization, this book about the Egyptian Revolution makes an important contribution to current debates about the Arab uprisings by bringing together theoretical and practitioner’s perspectives. The clear aim of this edited volume of the series Contemporary Studies on the MENA Region is not to construct a singular narrative about the revolution but rather to highlight the multiplicity and complexity of perspectives and theoretical lenses. Consequently, this book brings together authors from diverse academic and cultural backgrounds, from the Middle East and the Global North, to raise their voices. This publication addresses scholars of the social sciences, peace and conflict research as well as anyone interested in developing a better understanding of the political situation in Egypt. “It is rather easy to say no to a dictator, a ruler or a political system, but it is exhausting to build a new society. This requires the constant effort of dedicated generations. This book embraces not a master plan for a better future but it reflects from where this splendid young generation has to start anyway, the thorny challenges that are waiting for them on their path, the uncertainty of social or political reward.” – Wolfgang Dietrich, UNESCO Chair for Peace Studies, University of Innsbruck, Austria Adham Hamed is a Cairo-based peace and conflict researcher. In his work he focuses on transrational peace philosophy and elicitive conflict transformation as it has been developed at the Innsbruck School of Peace Studies.